Sometimes those cloudy February days after the rush of the holidays can lead to an immense desire to go outside; outside of your house or office, outside of your routine to renew and make way for the freshness of spring. Beat February cabin fever by joining in one of these Ghost Ranch opportunities. A weekend of yoga, hiking and textile arts to open your eyes to the natural world in a multi-sensory way. Learn more. Celebrate with someone you love. Enjoy spending time together; rest or explore the magical landscape, includes tickets to the February 16 concert featuring Grammy-winner Robert Mirabal. Learn more. Overnight packages available or join us for dinner and the concert. Learn more about the work of intentional transitional/ interim ministry and discern if God may be calling you to this work. Learn more. For outdoor enthusiasts or trip leaders who want a basic level of first aid training for short trips with family, friends, students or outdoor groups. Learn more. Paint in studio and in plein air the areas where O’Keeffe painted with Michelle Chrisman. Learn more. Enjoy five days of writing exercises, deep dialogue and meditation. Learn more. 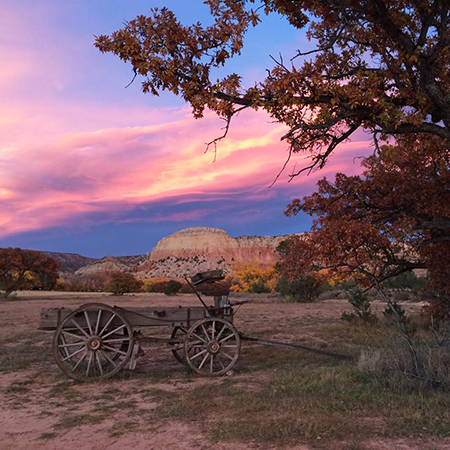 Ghost Ranch’s 9th Annual Photo Contest is Here!